Suede and Chrome is a great little blog with a traditional hot rod vibe, but open to other automotive endeavors if they are interesting enough. I’m giving you the main page, because the first few stories as of this writing are from a car show and open house at Bubba’s Garage in Speedway, Ind. As usual, I love the car show coverage, but this is particularly apropos this week because he also visited the Dallara plant where Indy Cars are built. Of course, the Indy 500 is this weekend, so some of the cars that he took pictures of being constructed will be on the track. Check out all the great pictures by visiting the link. Right down the road in Lawrence, Kan., there is a junk car auction that is generating some national attention. 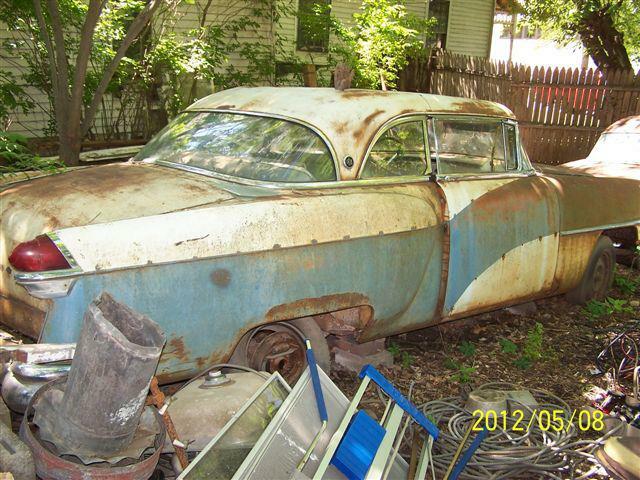 This weekend, Elston Auction Company will be selling off a lot full of dilapidated old cars, most of them Packards. The story goes that this was originally the site of a Packard dealer back in the day. When Packard went out of business, he continued to service the stately rides. Eventually, that business stopped, and there was a whole lot full of Packards that were abandoned in a state of disrepair. Now, the city of Lawrence wants the lot cleared off, so the owner’s living relatives are charged with selling the forgotten luxury cars. Check out the handbill here. Earlier this week, we checked out the Micro-Mini Car Show in Westwood. 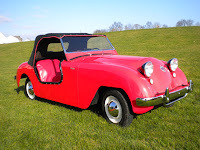 As it happens, Old Cars Weekly has a great story on the Crosely Hot Shot. Crosley really made their mark selling radios and refrigerators, but they did have an impact with their diminutive two-seaters. 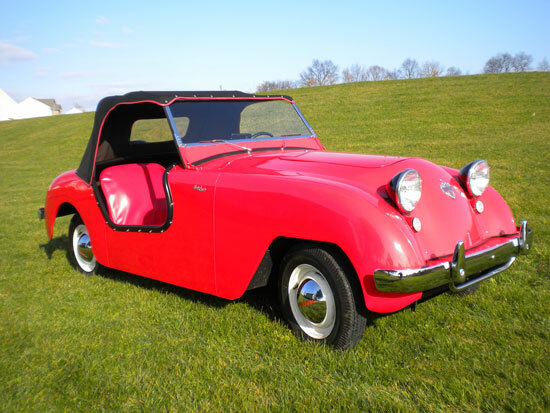 Today, these little cars have a cult following, and even people that wouldn’t have been caught dead in one when they were new have often developed soft spots for the cute little runabouts. Author Brian Earnest does a great job with this detailed profile of the red 1951 Hot Shot featured in the story. You’ll want to click this link to read all about it. 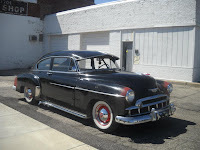 Curbside Classics is a neat blog site at which they find interesting old cars parked on the street, then set out to learn more about their history. 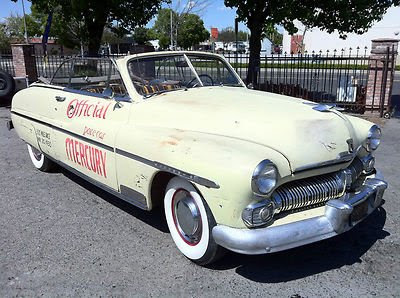 In honor of Indy 500 weekend, they feature an earthy 1950 Mercury Indy pace car, then set out to discuss Indy pace car history from 1950 to 1954. There are other stories for different time periods there as well if you want to look for them. I put up a Chevrolet pace car retrospective yesterday, so I obviously like them. There are lots of great pictures and related information there. I’m sure you’ll enjoy it. Click here for the whole enchilada. 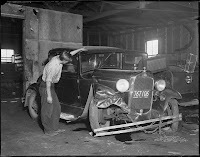 Old car crashes can be sad and gruesome and all that, but for some reason, I really enjoy looking at pictures of them. Vintage photos of contemporary car wrecks really set the context that the old cars we pamper and cherish now were once everyday drivers. And when you look at how some of these cars disintegrate upon impact, or how many of them wind up with telltale damage like head impressions in the windshield glass, you really begin to appreciate how much safer cars are today. 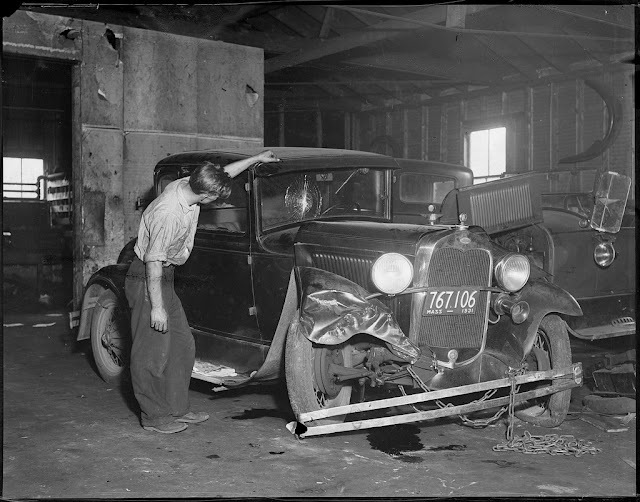 The Jalopy Journal brings us a nice little selection of photos from the Boston Public Library. I especially like the Mack truck that is dangling precariously from the smashed wall of an old factory or parking garage. Enjoy all the mayhem by clicking this link.